126 Monday November 15th 1875. I put in the whole forenoon with the help of Lee in filling the bed ticks up stairs with new straw. I did not get quite done before dinner But finished as soon as we washed the dishes. That done I cleaned the lamp. Mother and I went to town in the buggy in the afternoon. We did not get any thing but groceries. And she paid some bills she owed. I practiced in the evening. Weather disagreeable. Tuesday November 16th 1875. I swept and dusted the house all over this morning, and helped get the dinner. In the afternoon Mother and I put down the kitchen carpet. After the supper dishes were washed I practiced an hour and answered a letter I recieved from Billy Reed today. 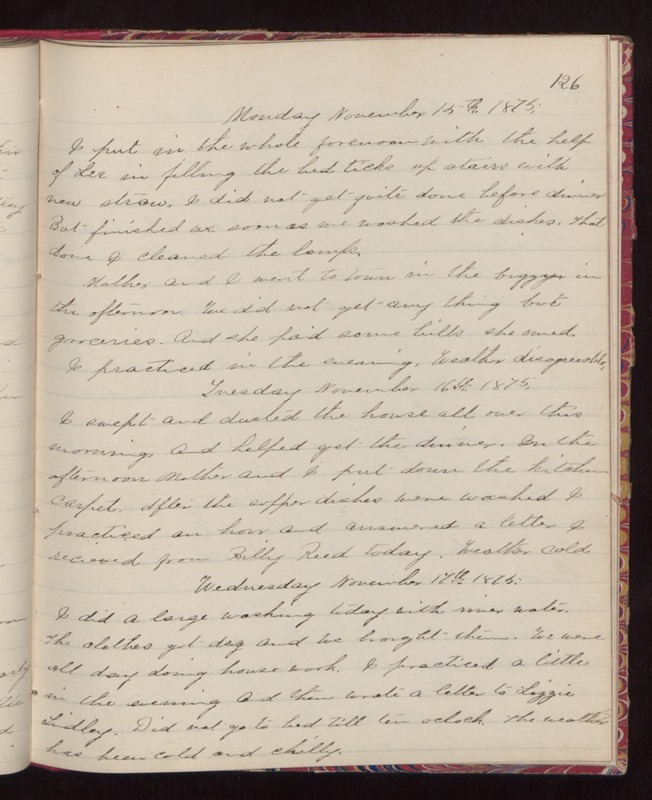 Weather cold Wednesday November 17th 1875. I did a large washing today with river water. The clothes got dry and we brought them. We were all day doing house-work. I practiced a little in the morning and then wrote a letter to Lizzie Lindley. Did not got to bed till ten oclock. The weather has been cold and chilly.